Recently, acclaimed works like the film Lump Sugar and SBS TV special My Love Toram have shown that films with animals can be more than fuzzy lightweight tearjerkers and, in fact, be compelling cinema. As such, Chungmuro's newest entry into the man's-best-friend genre, Heart Is..., is certainly a cause for anticipation, especially when it stars Yoo Seung Ho, the mischievous boy from The Way Home. Already a minor star in Korea, Yoo is sure to find even more popularity with this film and his upcoming appearance in Bae Yong Joon's mega-budget fusion historical drama, due to air in early 2007. 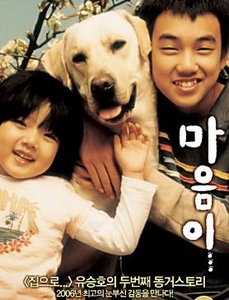 Park Eun Hyung's debut film Heart Is... stars Yoo as Chan Yi, an 11-year-old boy living alone with his 6-year-old sister, So Yi. On the day of her birthday, he steals a little puppy to give to her as a present, a present that will become the most important companion of their young lives. Named Heart, the dog keeps growing and helping the two children. When a terrible accident occurs, however, Chan Yi's relationship with Heart changes forever.